Boutique 9 is an exquisite women's footwear brand. Each pair of shoes is handcrafted with the finest of materials, delivering alluring styles that are fantastically fashion-forward. Accessible and highly coveted, each collection is underpinned by a strong attention to detail and appeals to all confident women with an edgy, rebellious side. 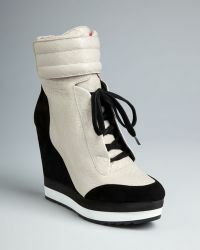 Sandals, boots and trainers reign supreme throughout this range of Boutique 9 wedges. Each shoe is superbly modern, offering a quirky and wearable alternative to stilettos. Novel materials, vibrant colourways and adornments cleverly update key styles.